The experience of a divorce can create a lot of emotions and feelings that can spiral into various mental health problems. There is a notion of masculinity that men don't need to seek help for problems, regarding feelings. Seeking help from therapy is being proactive with your own problems. "Being proactive about what ails you does not make you weak. It makes you smart." Divorce is an emotionally-taxing experience. Due to one’s need to keep their focus on the case in front of them, it can feel like the emotional baggage that it creates cannot be unpacked until after the experience is over and done with. The psychological impact of divorce can vary, based on the individual, but unpacking all of the emotions requires the need for a professional. Seeking help is not necessarily something that everyone is interested in, especially after a divorce. However, if a person is worried about seeking mental health treatment, they should understand that more Americans are seeking help for mental health issues than ever before. According to the American Psychological Association, 91 percent of Americans surveyed reported that they would likely consult or recommend a mental health professional if they or a family member were experiencing a problem. Additionally, 48 percent of those surveyed reported a visit to a mental health professional by someone in their household during the course of the calendar year. 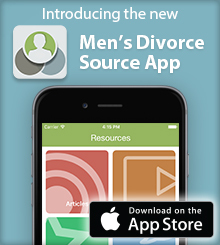 For many men who have suffered through a divorce, there is a stigma behind asking for help, based on a preconceived notion of masculinity and how it differs from masculinity in 21st century America. According to the American Psychological Association, many men feel that their ideology, based on a set of gender norms that highlight features like self-reliance, restriction of emotional expression, heterosexual behaviors, toughness, dominance, and the avoidance of traditionally feminine attitudes and behaviors. Asking for help can make many men who fall in this spectrum feel weak and lesser of themselves. There is a notion that real men solve their own problems, according to Good Therapy. However, reports from Men’s Health suggest that more and more men are seeking help, in an effort to be the best men that they can be. Reports from Psychology Today also suggest that the real challenge for most men in today’s society is to understand the truth of their essential nature and end whatever fears and weaknesses that would prevent them from acting in accordance with that. Therapists encourage these men to be the best versions of themselves by tearing down the very weaknesses that the preconceived notions point to as reasons for not going to therapy in the first place, making these individuals healthier. After the weight of divorce and suffering through that experience, many men could find comfort in creating that dialogue with a professional. Communication is a key aspect for men who are trying therapy for the first time. Therapists are looking to make you as comfortable as possible, in an effort to create the dialogue necessary to better improve your health. After a divorce, the emotions and feelings you have regarding your ex-spouse and the experience itself can be a lot unpack, so a therapist may start off with something small to help get to know you, as a person. It helps them frame you and give them a better understanding of how to go about helping you. According to Men’s Health, some therapists look to start off the conversation with a simple card game or may even suggest using a medium like email or video chat, in order to better connect with you on your level. During your first session, therapists are not seeking a level of vulnerability that they would from a long-time visitor. They’re trying to create a relaxed atmosphere that lends itself to opening up and discussing what is really on your mind. For men who have children, the ever-present world of custody and child support can create an increased need to open up to someone. They see their identity slowly shifting into a person whose sole reason for existence is to provide for individuals they can no longer care for under their roof. The empty home feels like a mirror image of what their bank account looks like, and finding a person to express these feelings to, without the judgement of having to feel guilty for having these thoughts and feelings, can be an important step to discovering how to be a better parent. It also can help you communicate better with a co-parent, as you both monitor how a child or the children are adjusting to their new living situation. It’s also important to remain positive during this process. There are many aspects about sharing your own issues with others that can get dark or negative, and to a certain extent, it can be healthy to let the experience go there. However, you are seeking therapy in order to improve your own mental health, and it’s okay to look ahead to being better off for the experience. Being proactive about what ails you does not make you weak. It makes you smart. After a divorce, seeking a therapist who you can express your feelings without the fear of judgement is important. Therapists have no agenda but you. You are their concern. Not your ex-spouse. Not your former marriage. Not your divorce. Not even your children. A therapist’s primary focus is to help you sort out the mental and emotional baggage that comes with the divorce experience and make sense of all of these feelings and notions, as you move forward.